French and British cabinets feature plenty of detailing, dentil cornices and proud skirting boards, flutes, pilasters, and corbels. 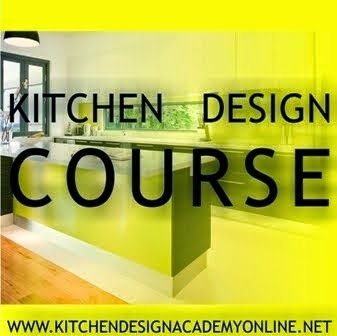 Some kitchens are more ornate than others, depending on the company and the client’s requirements. The wood or paint is often distressed, giving it a weathered look. You’ll commonly find some overhead cupboards left open for displaying plateware and a combination of wood or glass cabinet doors throughout. 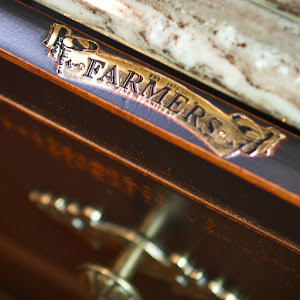 Handles are porcelain, wooden, or wrought iron knobs. Most large kitchen manufacturing companies will have those styles in their collection in a more or less elaborated degree. Small companies tend to avoid country styles, due to a high level of craftsmanship required, manual work involved, and the complexity of detailing. This country kitchen features plenty of detailing: bolection moulding for doors and drawer front, large top moulding, proud skirting boards around the island, fluted columns with bullseye in front of the island, and large mantle with corbels around stove. Classic handles, colonial bars, and tiled splashback. Photo courtesy: Farmers Doors, Western Australia. As countertops timber, granite, and even polished, coloured concrete all look beautiful in country kitchens. Profiles for the tops vary from double half bull nose to Dupont bull nose or ogee bull-nose offset. 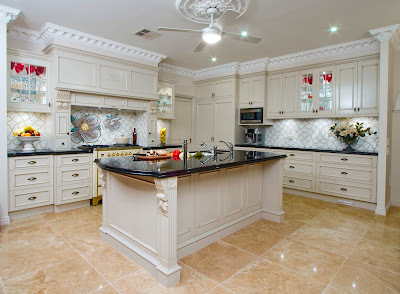 Kitchen islands are usually more ornate than the rest of the kitchen with fluted columns and corbels in the corners and can feature a different counter surface such as dark wood. Sometimes, the island houses a large butler porcelain sink (farmhouse sink). The backsplash behind the oven can be simple or ornate and tiles look best, especially if slightly irregular for a handmade appearance. Earth tones give the kitchen a more rustic look. Cabinet’s colour scheme is based around off-whites in hues of yellow from buttery cream to golden sunflower or hues of green from olive or sage to deep fir green and pale to medium blues in the distressed style. Probably, these styles are the only ones that can take a blue colour in the scheme. For a real old-world glow, look for warm yellow, creamy white, soft grey, and earthy terracotta, or you can colour-wash and glaze multiple mellow earthy tones.